Michael McCrudden, was thrilled to win the Belleek Football Writers' Championship Player of the Month for February. INSTITUTE’S Michael McCrudden admits he would love to end his career by scoring the winning goal against a side Stephen Kenny is managing. The talented striker, who picked up the Belleek Football Writers’ Championship Player of the Month on Tuesday for his display in February, spent a season at Derry City under Kenny’s management. “My time at Derry was my lowest point that I have ever been and when I left my main goal was to score the winning goal against Stephen Kenny’s team and that’s not good,” he stated. “To be honest I would have been happy finishing my career scoring the winning goal against Stephen Kenny’s team and that’s wrong, but that’s the way I felt. “I have said before that I hated every minute of my time at Derry City, everything was awful. The one time Newcastle United starlet also believes his poor experience with the Candy Stripes has made him a better player. “In footballing terms my time at Derry City hasn’t helped me, but mentally it has helped me a big lot,” he added. “Because I didn’t get a chance at Derry it has driven me on to sort of prove to them that they were a wee bit wrong as I have a wee bit about me. The Gobnascale man who was thrilled to win the Football Writers’ award conceded he would be happy to hand back all his accolades and goals as long as ’Stute were guaranteed Premiership football next season. “Obviously everyone knows the main thing is that we want to get promoted. “But it’s always good to get on the score-sheet and obviously as a front man you want to score goals, but to be honest it would take all those goals away from myself as long as the team keeps winning. Last weekend the 21-year-old help the Drumahoe club reach the last four of the Coca Cola Intermediate Cup after they defeated Glentoran Seconds, but McCrudden was a little bit disappointed that they didn’t pick up more points in the league. “I think we would rather have liked to have played in the league, but that’s the way the fixtures were and at the end of the day we won again and it’s nice that we are still in the Intermediate Cup, because it’s nice to get runs in cup competitions. 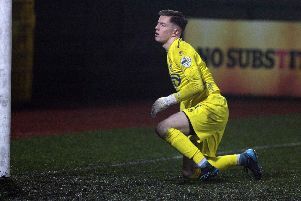 McCrudden, who is big mates with current Newcastle United and Northern Ireland international Shane Ferguson, still has high hopes that he can still make himself a career back in England. “That is everyone’s number one goal to play football full-time and I would love a second chance at it. “I don’t think I would be afraid of it, I do believe I can do it, but it’s all about getting that chance and more importantly taking it when you get it.